I brave my honeybees to make this deliciously authentic dessert, but you don’t have to! 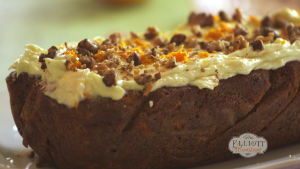 Honey is the secret weapon in this rustic carrot cake and its cream cheese frosting. Who knew eating vegetables could “bee” so sweet? Combine the butter and sugar in a mixer. Whip until light and fluffy. Drizzle in honey and continue to whip. Add egg yolks one at a time. Add vanilla extract, flour, baking soda, cinnamon, nutmeg, walnuts and carrot. Continue mixing until combined. Pour batter into parchment-lined or heavily buttered loaf pan. Bake for about 40 minutes. Check if done by inserting a toothpick into the middle of cake. When it comes out clean, remove from oven. Let cake rest until cooled. Combine cream cheese, honey and vanilla in a mixer until light and fluffy. Remove cake from pan and spread frosting on top – garnish with walnuts and orange zest. « One millisecond at a time. Your ingredient list is mixed up. Some of your cake ingredients are under the icing list. I’m trying this today! Doesnt look mixed up to me ..
unless the blog has been edited since… cake sounds delicious! Shaye, these videos are absolute gold! I was in a bit of a slump as far as cooking/eating goes, but now my passion is reignited. you rock! This sounds amazing. My father’s favorite cake is carrot cake and his birthday is coming up. I will have to try this recipe on him! yum! Girlfriend, looks like you’ll be signing a contract with Food Network soon enough! We have fun watching your videos and was hoping after your first one that you would do more. I’m sure that you have fun doing it but who’s watching the rascals? Hi Shaye. The recipe calls for all purpose flour. We mill our flour; should I use soft white only or mix soft with hard? Thanks! I am enjoying all the new videos!! I went to subscribe to your channel and all the old videos are gone. 🙁 I would absolutely love if you’d put them back up, my children loved watching them! Looks delicious and I bet the honey makes it so good! Your family is fun to watch, we have a small farm in Southern Oregon and have three young kids so it is fun to see how another somewhat similar family lives. I am always looking for a way to use my extra eggs, and the honey. This is perhaps the best carrot cake I have ever had or made. I took a few liberties – used all honey instead of using sugar, used raisins instead of walnuts. I can’t stop eating it…. Hi Shaye, I made this cake yesterday as we had friends staying for the weekend. I was really disappointed when it didn’t rise in a nice shape like a good cake is supposed to! I thought I am never making this again. I did what you suggested and iced it, and decorated according to your instructions. Then I tasted it. Oh my. It can go ahead and be a sinker. So. So. So. De-.lish-ous!!! Thanks for the recipe! We can’t have butter what would be the equivalent measuring for ghee? I just found your blog today & I love it! P.S. Rustic carrot cake’s in the oven! Can I use einkorn flour instead of AP flour? I found your blog a few weeks ago and absolutely love it! Carrot cake is my husband’s favorite dessert so I tried your recipe out today (Valentine’s Day) and it was a hit. Looking forward to getting my hands on your new cook book. Can’t wait! This was a big hit with my peeps. It didn’t last two days! Thank you! Oh! printing this recipe for when W30 is done! Looks perfect! Hi Shaye,Thank you ,for sharing the recepe from ‘ the carrot cake’ .I,ll already put him in the oven and it smells heavenly! I HIGHLY recommend using less butter if you are accustomed to a drier cake. I followed this recipe exactly and the consistency was more spongy than I expected. Overall though, the flavor is great, I will definitely use honey and egg yolks in the next carrot cake I bake. Don’t be shy with the spices either, this recipe can handle more spice. If I wanted to make this in a cake pan what size would it fill and about how long to bake it? I’m guessing it would not fill a 9 x13, maybe 8×8?